iMPC is certainly fun to throw beats together with, but it's all very 'short range', and with the exception of the excellent bundled samples, nothing really sets it apart from the many other grooveboxes and mini-DAWs in the App Store. Price. Superb library of samples. No sample slicing/editing. No song mode. Limited effects. 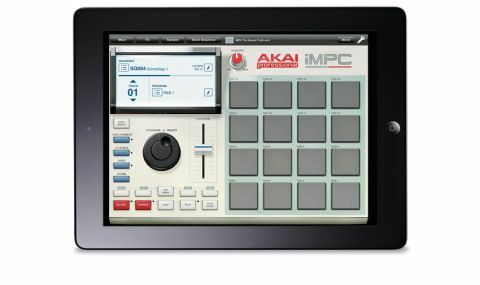 Let's start this review by pointing out the obvious: five quid is never going to buy you a fully functional Akai MPC emulation for any platform, and that includes the unique economical wonderland that is the App Store. "For five quid you can now get your hands on an iPad 'MPC lite', featuring an easy workflow and a library of 1200 samples"
With that said, the good news is that for five quid you can now get your hands on an iPad 'MPC lite', featuring a similarly easy workflow, a superb bundled library of 1200 samples (from pop, house and R&B to hip-hop, techno and grime), and compatibility with Akai's MPC Fly iPad controller (which we'll be looking at in the near future). It's also the first 'third-party' app that can be loaded into Retronyms' Tabletop iPad studio app, automatically appearing as an available module within it when installed, and taking on a whole new level of functionality, particularly in the sequencing department. iMPC was in fact also developed by Retronyms, you may not be surprised to learn. So, you get four tracks, each of which has a Program loaded into it. A Program comprises 16 samples triggered using the 16 touchpads, and your performance is recorded into an inbuilt sequencer. A handful of key MPC-style sequencing features are onboard, including Note Repeat, Time Correct (with Swing) and the all- important 16 levels, as are three effects (Bitcrusher, Delay and Master Compressor/Limiter) and a four-channel mixer. A wealth of preset Programs and Sequences give you plenty of material to get started with, and external sounds can also be recorded - although the lack of any sort of sample slicing or editing severely limits their usefulness.